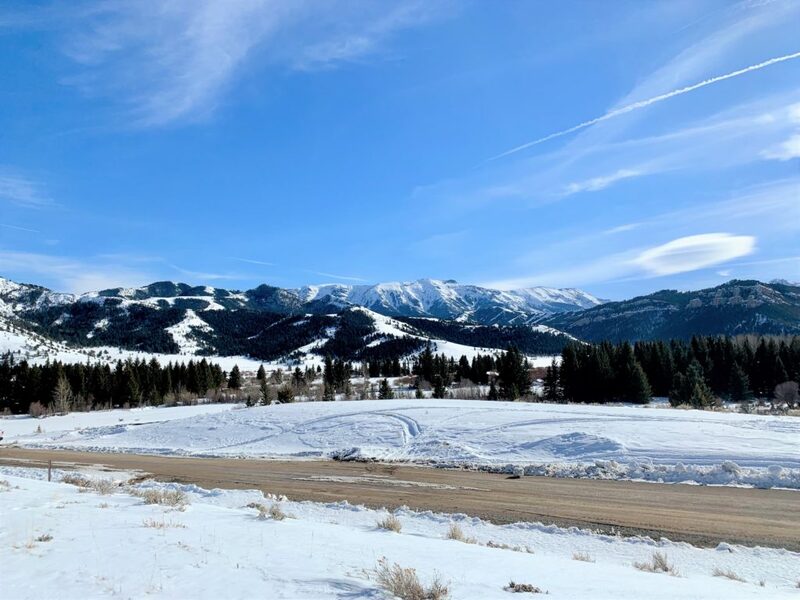 It sure feels like Spring both in Cody and in Sunlight Basin! The energy in Cody has shifted from winter cozy to early-tourist season and it is tangible! 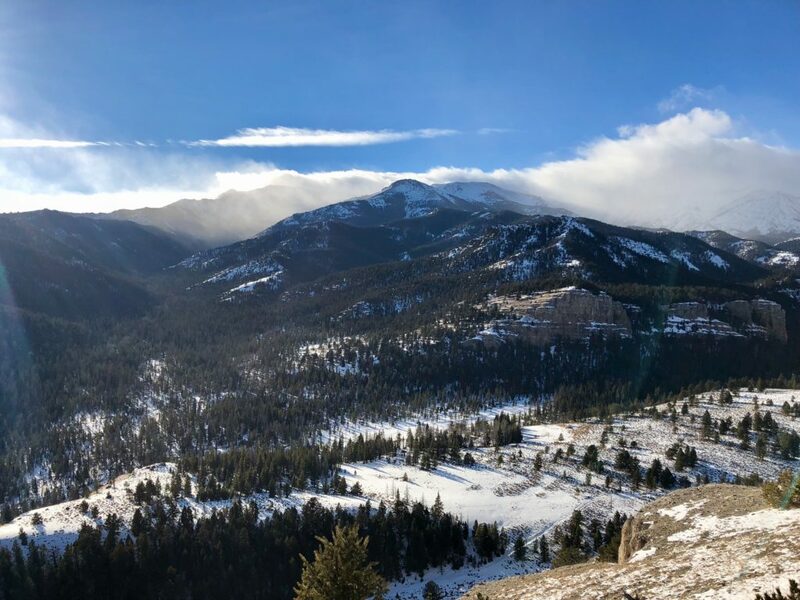 We are experiencing temperatures in the 60s this weekend and we couldn’t be more excited to see some of that snow melting away and making room for the green grass! Here at the ranch we collect miscellaneous items and they culminate into what is known as “the burn pile”. 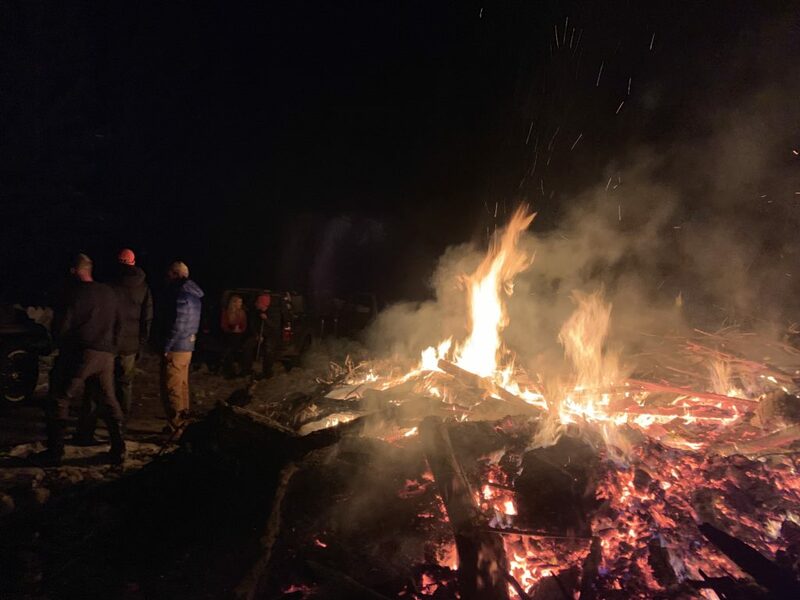 Each winter, we burn the burn pile and watch as the flames shoot as high as 30 feet into the night sky! A creative, reflective narrative was sent to us by one of our gorgeous wranglers and we are so excited to share it with you…! “My alarm rings and I groggily fumble for the phone to press snooze as my mind ponders why it’s going off so early. It’s 4:30. Then I remember. It’s a wrangle morning. I drag myself out of the warm covers and hurriedly pull on the multiple layers I had laid out the night before. Once braced for the cold that I know is on the other side of my sheep wagon’s door, I reach for the handle, take one more longing look at my warm bed, and push it open. My eyes don’t have to make much of an adjustment from the cave-like dark of my wagon to the softer dark of the early, early morning. A thin sliver of moon glows reservedly so that the milder light of a galaxy of stars can sparkle and shine from the dark heavens. I pause for a moment in the doorframe, taking in Orion’s morning greeting and then push out into the chill. My boots crunches lightly on grass hardened by frost and follow a well-worn path that my eyes cannot see down to the corrals. As I near the gate, I hear a soft munching of hay and a familiar nicker from my favorite mare. I grab the halter from the hook and enter the corrals, heading toward the two shadows near the black mound I know to be the hay feeder. San Lena, though usually adept and eager to avoid the halter, steps toward me and allows me to slip the band over her ears and lead her away. On mornings when she is tasked with ‘dudes,’ she seems to have a premonition of what is to come and loves forcing you into a game of tag through the corrals. But on wrangle mornings she seems impatient to get started, as if she would go gather the herd herself if I don’t get a saddle on her fast. As I’m tacking up under the single barn light, my fellow wrangler leads their mount up beside mine, we mumble a quiet greeting and finish up in silence. We grab our radios, decide who is going for which herd first, mount up and slip into the darkness. San Lena and I are bringing in the Short Herd first so we head towards the river crossing, passing the spot where last Fall on a similar dark morning San Lena had thrown an unusual fit. I had taken the odd behavior as a sign, changing our route and avoiding a bear invisible to me until we returned 30 minutes later with the herd and enough light for me to see what she had sensed-a young grizzly in the middle of the river crossing. The memory fades as splashes of cold river water reach me from San Lena’s prancing feet. Neither of us are eager for the chilly water so the river crossing passes too quickly for me to truly cherish the glimmer of moon and stars on the water or the sacred morning silence despite the rush and flow of water. As we near the herd, San Lena sends out a shrill call for her pasture mate. He’s not in this herd and for a moment, Lena is distracted in her search for him. That is, until I give the call and the first horses move for the gate. Now I have her attention. 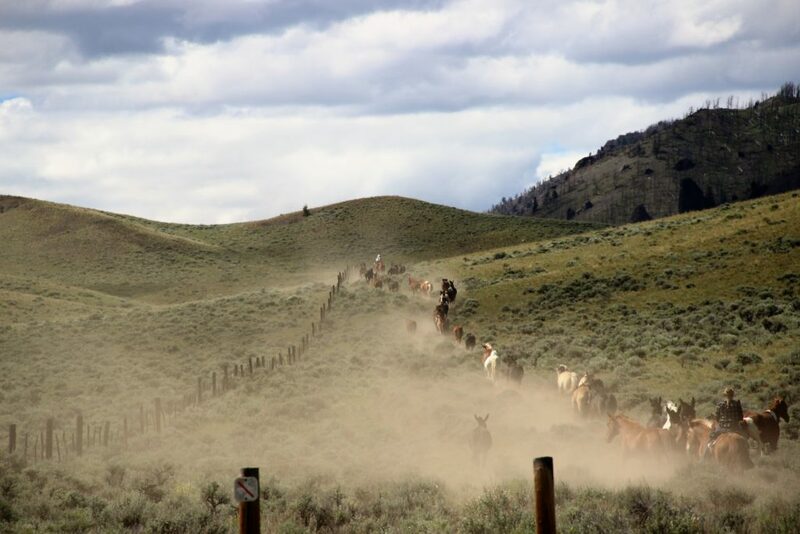 We head for the far point in the rectangular pasture and upon reaching it, whip around, the entire herd between us and the closed gate that leads back to the ranch. Then I let her go and relish her innate talent as a wrangle horse. She rushes at horses that are slow to wake and get moving and she needs but a touch to sprint after the few who deviate in hopes of a few more mouthfuls of sweet grass. By this time in the morning, the sun is just beginning to bring light to the far end of the valley and I get a quick misty count, now all waiting at the gate. Once I’m sure everyone is accounted for, San Lena and I make our way to the gate and I give one final call before releasing the latch and moving San Lena to the side as the herd rushes out before us. As soon as the last slow-mover is out, we fall in and chase the herd, picking up stragglers and pushing them through the woods. Dark browns and forest greens blur as I track the horses through the trees, watching the trouble makers I know will scoot off and hide if I don’t stay with them. Lena moves effortlessly, crossing trails and logs as needed to keep the herd together and moving. We make it back to the river and the horses charge through, early morning light catching in the water drops and spraying cold rays of light everywhere. The chill of the water is no longer a thought and I enjoy the cooling spray as I pop the last straggler with my rein and he reacts with a splashing gallop ahead of me. The herd stalls reluctantly outside of the corrals, grabbing a few more bites before Lena comes charging up and they scamper through the gate. I pull Lena up to close the gate and get one more count of the milling animals as they resettle into their hierarchal positions and cliques that are the ruling order of the corrals. I radio in to my partner to see how the other herd is and where I’m needed before heading once again away from the corrals, this time to where Long Herd spent the night. At this time of the season the herd is out at Falcon Rock, one of the more distant pastures, and Lena picks up her pace knowing she’ll find her pasture mate in this one. The sun is now peeking over the mountain and its rays stretch from the horizon point, piercing the purple and pink clouds of a sky slowly wakening. Coming from the Blue Ridge Mountains in North Carolina, I had never understood the phrase “Purple Mountain Majesties” (mine are incredible shades of blue) until I came to the ranch. But this morning, Elkhorn is a royal purple in the distance, majestically crowned by the sun resting along the ridge. I take in the peace and awe of the morning as we steadily climb, Lena’s measured trot and early morning bird songs a tranquil soundtrack to the musings. Once we reach the crest where Electric Ridge meets Anthill, we get our first view of Falcon Rock and the small distant dots that make up Long Herd. My partner has had a good start and nearly all 50 horses and mules are waiting at the gate. I recount on my way down and check for trouble-makers that often hide during the morning round ups. Between the two wranglers, if we know how many we’re missing, we can normally guess who it is and typically where they are. This morning it looks like two geldings that hang out by themselves. I radio my partner to see where they’ve already been this morning and we agree that they’ll check a high vale the horses like since they’re already on the ridgeline and I’ll stay low, checking the fence-line and lower nooks and crannies (this large pasture has plenty of them). I enter the gate and San Lena’s mate runs up to greet her, dismayed that she is under saddle and still on the job. He follows for a bit, the two exchanging calls as we trace the fence-line to check a gate that has been left open in the past – spelling a long morning for the wranglers on duty that day. I hold my breath and listen for the light tinkle of a bell as we move along. Normally we bell the lead mares of groups to make finding the horses on dark mornings or in big pastures easier. I can’t remember if the two we’re missing have a bell so I give out a call, hoping this brings them in rather than letting them know where to run from to evade me. Lena and I reach the far corner and see that the gate is indeed closed, though that doesn’t get us closer to finding them. Doubting the ease of the morning, I move up and around the ridge that leads down to that gate to do a quick scan of the pines before turning to leave in hopes of catching them closer to the herd. Luckily my brain caught something my eyes didn’t register and when I look back there are the geldings, staring sheepishly at me from among the pines and frozen as if hoping I wouldn’t notice. This wrangler blog would be a lovely addition to the cabin notebooks this summer!